Digital Worlds is a perfect fit for private parties like birthdays, corporate events, and much more. We can accommodate private events outside of normal business hours (Mondays and before 4pm on weekdays). LINK TO THE WAIVER. The whole location is booked for your event. There is not a ‘party room’ but instead the whole arcade is the party room. To better ensure that you can get the full location for your event, especially if it’s on a Fri, Sat or Sun, please schedule your event at least two weeks in advance. Seven VR stations that are each 100 square feet. Only one person is in VR at any time for each station. There is a 50” TV at every station so that party members are able to watch friends and co-workers gameplay even when they’re not in VR. Four ottoman benches for party members to sit at while not in VR. Can be used to watch those players in VR and also for eating. For additional seating as well as anyone wanting a back rest, we also have multiple folding chairs. Catering is not currently something that DWVR is offering. We do sell some fruit and protein bars and a variety of drinks, but we’re still working on our catering partnerships for now. 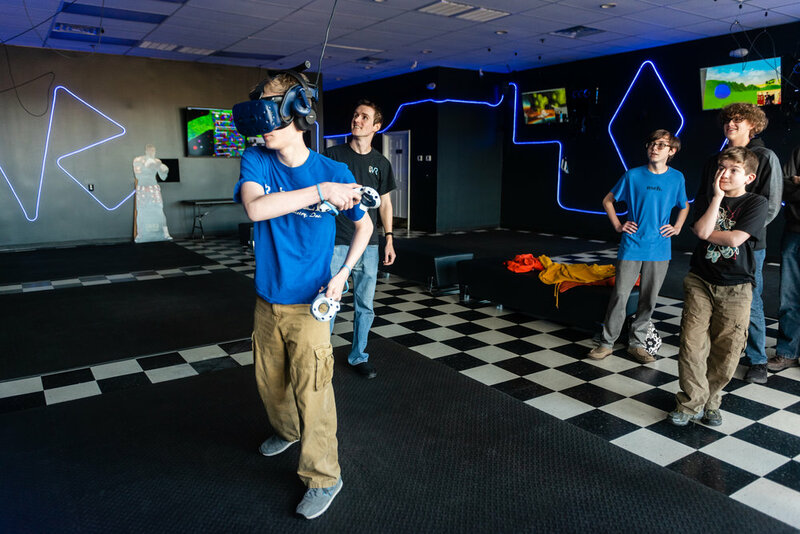 Fill out the form below or contact us by phone at 615-538-7514 or by email at Craig@DigitalWorldsVR.com for any questions you have about private events at DWVR or to schedule your event.